This is the new Philips Norelco commercial, featuring Jonathan Papelbon and Nick Swisher. Andy Pettitte didn’t get much work this past spring due to the inclement weather, and many questioned if he would be ready for the start of the season. The guy was born ready. He couldn’t have asked for any better weather either, as it was a beautiful day today. In the beginning of the game, Andy gave many Yankee fans a scare when he tumbled to the ground, while trying to tag out Jacoby Ellsbury before he reached 1st base. Pettitte really didn’t have much of a chance anyway, but thankfully he was okay. The trainers rushed out on the field, saw him take a few warm-up pitches and he was fine and dandy after that. Pettitte tossed 6 solid innings, allowing one run on 6 hits. His pitching line was: 6.0IP 6H 1R 1ER 3BB 4K (94 pitches, 54 for strikes) He didn’t factor into the decision though. Joe Girardi decided to hand the ball over to Chan Ho Park after Andy left the game, leaving many fans biting their nails. He didn’t have a very good outing on opening night, so everyone was on the edge of their seats. Thankfully, Park pitched really well. Girardi felt like Chamberlain needed some rest, and went with his gut. Chan Ho tossed 3 scoreless frames, and gave up only one hit. I didn’t think it was a smart move for Joe to send him out for a third inning, but it all worked out so I won’t complain. If Park imploded in that inning, you would have seen some major bashing by the media and fans. Let’s not forget that he had a rested David Robertson in the bullpen as well. Park picked up the win, moving his season record to (W, 1-1). Mariano Rivera got the ball in the 10th inning, shutting down the Red Sox 1-2-3 and picked up his second save of the season (S, 2). Nick Swisher went 1-for-4 on the game and picked up an RBI. Curtis Granderson went 2-for-4, with a run and an RBI. (Single, Home Run) In the top of the 10th inning, Granderson went yard off of Jonathan Papelbon to give the Yankees a 2-1 lead. In that same inning, Mark Teixeira (who still doesn’t have a hit on the season) hit a chopper to short, which allowed Brett Gardner to cross the plate and gave the team an insurance run. As a part of ESPN’s end of decade ‘Best of Series’ they have been having, they have named Mariano Rivera as the most valuable pitcher of the 2000’s (Cy Young of the Decade, if you will). Mariano had some stiff competition in being named this award (See: Johan Santana, Roy Halladay, Greg Maddux, etc al), but all his competition had various reasons for not being named for this award (Injuries, Off Years, Not Playing all of the 2000s, etc al). For Mariano, this is yet another accolade he is deservant of. While it is hard to quantify what Mariano has meant to the Yankees, Rebecca at Purist Bleeds Pinstripes tries to quantify how many wins Mariano has meant to the Yankees and does a damn good job and ESPN’s article does a damn good job as well. Enjoy ESPN’s article after the jump. 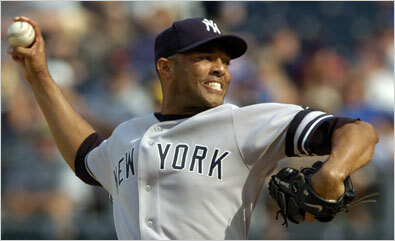 Today, Mariano Rivera at age 39 (during the season, he just turned 40) was announced as Sporting News’ 2009 Athlete of the Year after 44 saves out of 46 opportunities, 1.76 ERA, a .905 WHIP and 72 K’s in 62.1 innings, his first career RBI on the same night as his 500th save and five more postseason saves. I believe this award is well deserved, congrats Mariano! For this occasion and the printing of the article in Sporting News’ Magazine on December 21st Steve Greenberg interviewed The Sandman, Mariano Rivera.